There has been a few break, enter and steal offences committed on commercial premises where small amounts of money and property have been stolen. Other areas of crime such as malicious damage and assaults have remained steady with some incidents of graffiti being further investigated as the offenders have been captured on CCTV footage. 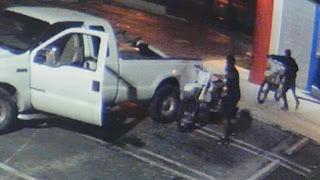 There has been a rise in a number of trail bikes being stolen from garages in the Camden Police patrol where the offenders use utes and vans to transport the stolen bikes (the image shown is NOT actual footage). A couple of years ago Helensburgh was targeted so owners need to be aware and ensure their bikes are secured. Any suspicious vehicles should be reported to Police with registration number and description. There was a report of a child approach in Stanwell Tops where upon investigation it was revealed not to be the case. Later this month on the 15th of September, 2013 will see the Hindu Temple holding their celebrations as part of the Ganesh Festival where a large number of devotees will be around the Temple. Parking and traffic sometimes poses problems which are often overcome quickly, but can I ask local road users to be patient and tolerant during the festivities. A traffic plan is in place and Police will be working to address any issues.